Author&apos;s Note: This article was originally intended to serve as a primer for those who might be considering their own "Photo Charter" on their favorite railroad. Now, instead of the originally intended step-by-step "how to" piece this article chronicles the account of my first attempt operating my own private photo-charter. Photo by K. R. Bell. It will come as no surprise to many RyPN readers that I have become quite a fan and supporter of the Middletown & Hummelstown, or M&H, Railroad. Even before the return-to-steam of No. 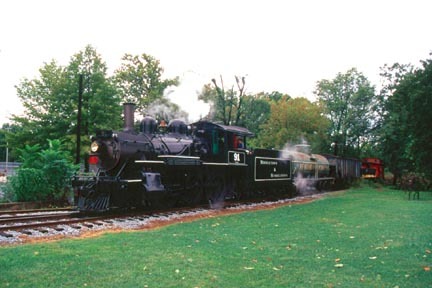 91, their charming 2-6-0, during August of 2003, I had made several trips to this line and come away with a smile every time. I&apos;ve also become good friends with several "M&H&apos;ers" along the way, and even volunteered on the road&apos;s Halloween train event. It wasn&apos;t long after No. 91, a 1910 Canadian National veteran, returned to the rails last summer that I developed a mental picture of that compact engine simmering in front of the classic "Kuppy&apos;s Diner," along the M&H&apos;s street running trackage in downtown Middletown. Only problem being that the line&apos;s steam excursions usually terminated a block away, at the vintage 1891 Reading Company freight station. "Why not charter your own train and get the shot"? That simple question, posed by a good M&H friend of mine, became the inspiration of my first foray into the sometimes-dicey world of photo charters. Several key elements had to fall into place before this notion could become reality. The first was timing. 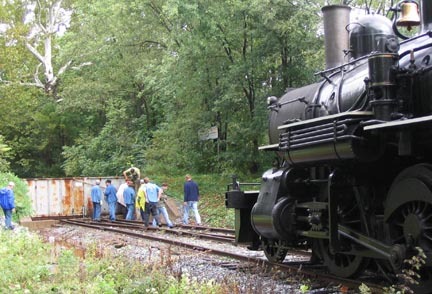 Early in the year the 91 would be undergoing work after a long winter hiatus. So, spring was out. During the summer months the train would see extensive use on weekend excursion trains, and my railroad job would prevent any weekday activities. Summer was out too. October would see frequent operation of the 91 on trains packed with fall foliage watchers. Fall was out. However, during September the locomotive was only scheduled to operate for a few special events, while diesels would cover the rest of the Sunday-only service running that month. Hmmm, September might work. 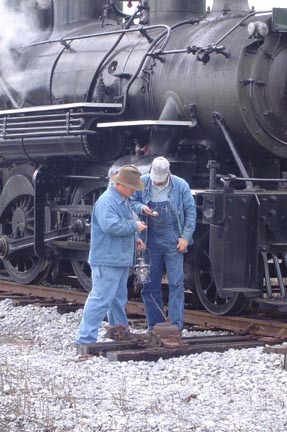 After hammering out logistics with Brian Bachman, the M&H&apos;s resident steam foreman, George Pellissier of the track department and my good friend Andy Ottinger, an M&H jack-of-all-trades who would be my conductor on the trip, it was time to propose the idea to the railroad&apos;s president. We presented the idea of my rental of a limited seating photo freight, that would not disrupt regular operations, create some memorable images and be financially beneficial to the railroad itself. After getting a very reasonable quote from management, the idea was a go! 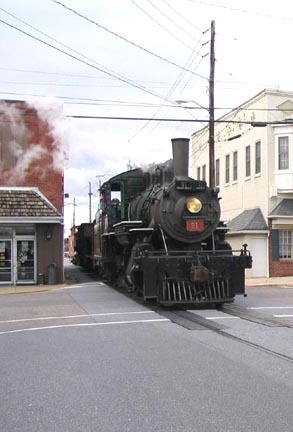 The M&H is blessed with an eclectic mix of rolling stock stored in Middletown and along the line to Hummelstown. After careful review, it was decided that several pieces of equipment could be used on the trip. The line is in possession of a rare Reading Company tank car, which alone made the freight train concept worth while. A functioning side dump car, a former C&O 3 bay hopper and CNJ Caboose would round out the short, but authentic consist. 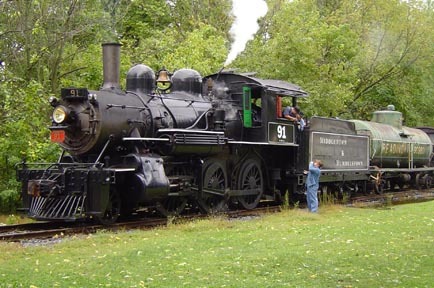 Early on it was decided not to alter the appearance of the 91, since the Strasburg Railroad had already pulled off a spectacular charter with a its own former 2-6-0, number 89, in authentic Canadian National livery, the previous fall. 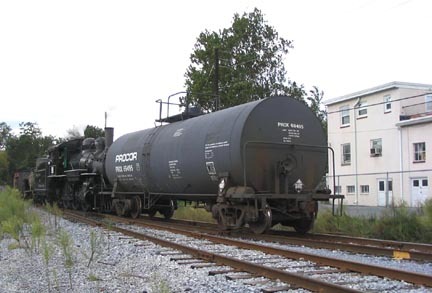 The resulting M&H freight train of 2004 was an attractive shortline consist that one might have seen on any number of short lines a half century ago. "Wouldn&apos;t it be great if we could go all the way to Hummelstown"? Regular M&H passenger excursions stop just short of Hummelstown proper at the famous "Indian Echo Caverns." 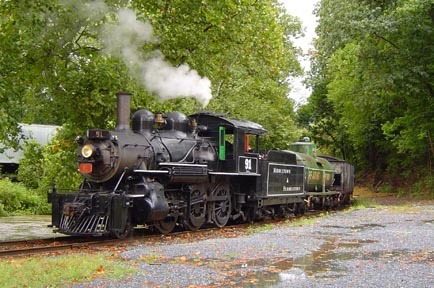 Only special events cross busy route 322 and traverse the scenic backyard and in-street trackage leading to the end of the line. 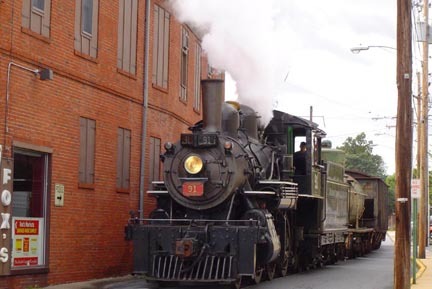 The last of these trips took place during the summer of 2003, and some track work would be required to allow safe passage through town. My response to George Pellissier, who not only presented the idea but would have to do the necessary track work to make it happen would be all the inspiration he needed. "George, there&apos;s a case of Sam Adams in it if you get us there." And so it was. I had a train, a real vintage steam freight train at that, and now rare mileage to boot. 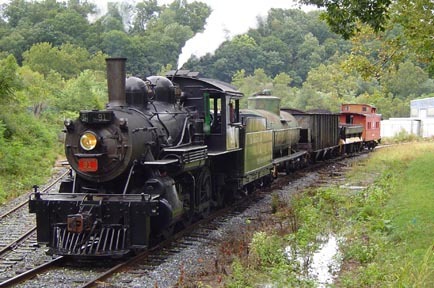 This would be the first ever steam special to go from end to end on the Middletown & Hummelstown. From derail to derail (NS interchange at Middletown to NS connection at Hummelstown) the railroad is 7 miles long, providing ample opportunities for unique photo stops along the line, which parallels the scenic Swatara Creek for much of its route. After convincing a dozen friends to partake in the event, everything was set. Its 9:30 AM, the rain has stopped, but water continues to rise around the M&H. Photo by K. R. Bell. During the week leading up to the storm I monitored the weather with the anticipation of am 8 year old on Christmas Eve. The forecast for the Harrisburg area for Saturday September 18th read "Rain, heavy at times overnight, ending early Saturday" as the remnants of Hurricane Ivan would pass through the area. Without the possibility of a make up day due to scheduling conflicts, I decided to run the train, rain or shine, and leave it up to my "customers" to ride, or not to ride, and only pay if they showed. "Rain heavy at times" was an understatement. I awoke Saturday morning to steady showers, but most of the damage had already been done the night before. Streams and rivers were beginning to swell and water was everywhere. Still, considering the work that myself and my friends had put into this project, the attitude of "have fun no matter what" would prevail. The original plan for the day was to do some photography along the Middletown street, before making several trips along the length of the entire M&H line. At around 9 am the M&H got word that local Emergency Management Personnel would be forced to close a levy gate across the M&H main just outside of Middletown proper at mid-day. 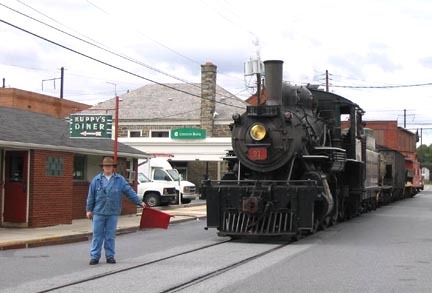 Our photo charter would only be making one run to Hummelstown. 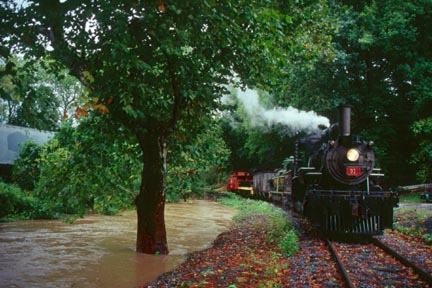 As the train departed at 9:30 am, the rain actually stopped, but the flooding from local rivers and streams had already pushed the Swatara Creek beyond capacity. Just past the Route 230 grade crossing outside of town, the floodwaters were already running freely several inches over the rails. 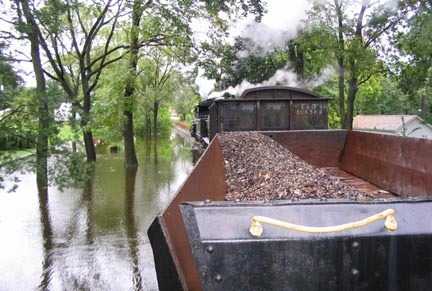 Within a few hours, several miles of the railroad would be under 5 feet of water. Fireman and Conductor discuss flooding during the first photo Stop. Photo by Dave Haser. Engine 91 performs a slow-speed "walk by" at Route 230 for the benefit of slow shutter speeds. Photo by Dave Haser. A tiny stream is about to overtake the M&H, within a few hours the railroad will be under several feet of water at this location. Photo by Dave Crosby. Around 10:30 it was decided to reverse the train back past the levy and conduct several hours worth of photo stops and run bys in the Middletown Yard area. 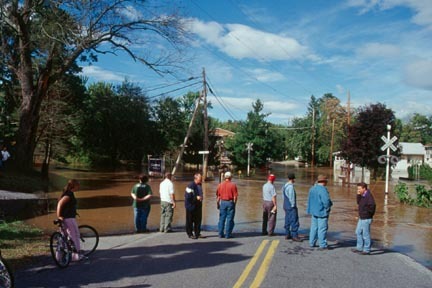 A quick photo stop would take place near the Route 230 grade crossing, where crew and guests marveled at how the adjacent creek was about to spill over its banks. Once the 91 and train had safely returned, a dozen photographers and railroad personnel watched as the heavy iron doors of the levy were closed with on ominous "thud". Emergency management officials close a levy across the M&H as photographers and the 91 look on. Photo by K. R. Bell. 1950 or 2004? Engine 91 train pose at Levy Curve. Photo by Dave Haser. 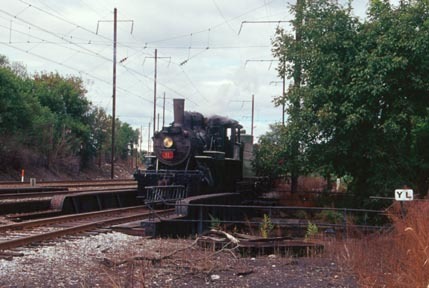 After the Gates had been closed, the short freight train was positioned along the aptly nicknamed "Levy Curve". As sunlight would be lacking throughout most of the morning, photo "stops" would be made in addition to the more traditional run bys. After the photographers had shot their fill of at Levy Curve, the train again reversed to the next grade crossing, a park like setting where several minutes of still photography took place. Brian and George, the 91&apos;s engine crew for the day, who had been "itching" to do a few run bys since the trip began, provided two fantastic displays of sound and motion at this location. The train then returned to the Middletown Yard for a watering break. The first "true" run by, as seen just outside the Middletown Yard. Photo by Dave Crosby. Steam on Amtrak, almost. The 91 and train back down the industrial track used by the M&H to interchange with Norfolk Southern, adjacent to the busy Amtrak Keystone Mainline. Photo by K. R. Bell. Nice spot for lunch! The 91 is truly at the "end of the line", MP 7 on the Middletown & Hummelstown. Photo by K. R. Bell. Steam on The Pennsy! Engine 91 poses where the M&H swings onto the old Pennsylvania (now Amtrak) grade. Photo by Dave Crosby. Since it was getting close to lunchtime, it was decided to pick up the pre-ordered lunches (a photo charter necessity) and back all the way to MP 7, the Junction with NS/Amtrak just west Middletown. This is the ultra-rare mileage section of track that had been the motivating factor behind this trip in the first place. Motorists and locals all appeared to stop what they were doing to watch the 90-year-old engine and its train slowly back through the middle of Brown Street, but the best would come later. The interchange track along the busy Philadelphia-Harrisburg Amtrak main provided a perfect spot for a half-hour lunch break. 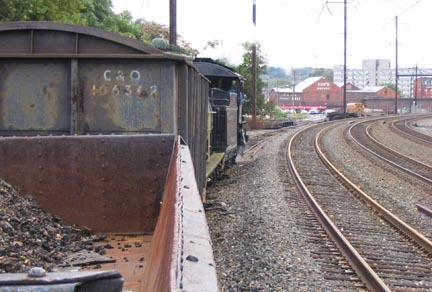 While almost all of the M&H Railroad between Middletown & Hummelstown is old Reading trackage, the interchange track actually swings onto the old Pennsylvania Main for a few hundred feet. Once the important business of nourishment was taken care of, and a few photographs taken to commemorate steam&apos;s rare appearance at this location, the train pulled forward to set of iron bridges, where passengers were allowed to detrain for another still shot. Then the main attraction would be presented. In a scene straight out of 1950, our vintage freight train drifts past Fox&apos;s Market, itself a throwback to the 1950&apos;s. Photo by Dave Haser. The shot that started it all. The two best things in Middletown, engine No. 91 and Kuppy&apos;s Diner. Photo by K. R. Bell. As photographers walked ahead of the train and positioned themselves on the corner of Brown and South Union Street, the 91 began to creep into view and stopped for a moment along side "Fox&apos;s Market", itself a throwback to the corner grocery stores of the 1950s. Then it was a quick walk to "Kuppy&apos;s Diner" for the posed shot I had envisioned for well over a year. 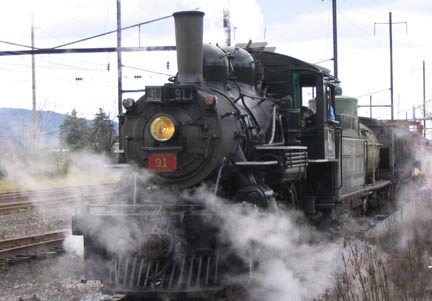 A steam engine, authentic freight train and a classic American diner, it doesn&apos;t get much better than this. 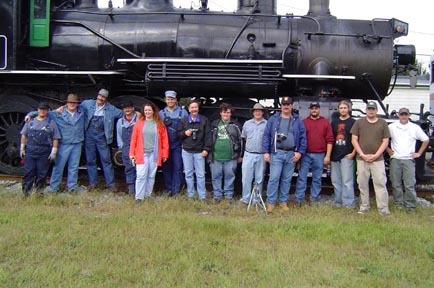 After several minutes of "ooh&apos;s and ah&apos;s" the train and photographers returned to the Middletown Yard of the M&H for a photo stop, and the mandatory visit to the company&apos;s gift shop. After the break, Brian was again getting restless, so another run by was performed to the delight of all present. The M&H to the rescue! Engine 91 pushes a tank car that will be used to brace the levy gates. Photo by K. R. Bell. Several more run bys would be conducted along the line at Univar USA, the M&H&apos;s largest freight customer. The group would even get to see some "current day" switching, as the 91 placed a modern tank car against the levy to act as a brace incase floodwaters pushed against the levy gates. A happy group. The three people most responsible for the success of the event are pictured left to right. George Pellissier, Andy Ottinger and Brian Bachman. Thanks also go to fireman Jim Brownawell, who co- fired the 91 this day , fourth from the left. Photo by Dave Haser. The M&H railroad performed admirably in the face of adversity that day. Throughout the event the whole crew carried the attitude of "What can we do for you"? If it were not for the efforts of Brian Bachmann, George Pellisier and Andy Ottinger the trip would not have occurred in the first place, let alone have been a success. I would also like to thank Wendell Dillinger for agreeing to the trip and supporting the endeavor as well. Postscript: After the 91 was put to bed for the evening the M&H crew, along with several photographers, took an inspection trip in an attempt to gauge the potential flood damage. Despite several locations being covered by several feet of water, the M&H was able to make repairs and open for business the following weekend. The line will be operating regular excursions and special events into December. Be sure and visit their website. A small stream gets angry! 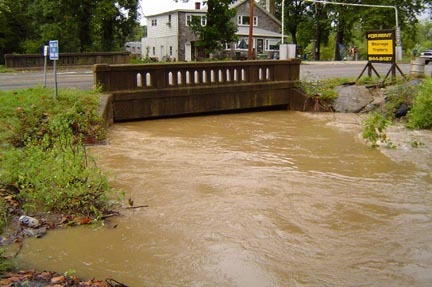 Early morning floodwaters rise under Route 230 adjacent to the M&H. Water would eventually crest over this bridge in the afternoon. Photo by Dave Haser. M&H Employees inspect the right of way at the Frey&apos;s Grove grade crossing. Photo by Dave Crosby.